If you're familiar with Pundit, you know he has a very strict definition of what an RPG should be. 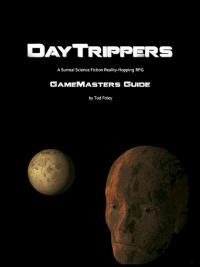 I knew when I contacted him that certain aspects of DayTrippers - such as working within a narrative arc or the scene-based action resolution system - not to mention the very notion of playing a "Genre Sim" at all - would not sit well in his wheelhouse. Still, I was very interested to see what the game looked like from his OSR perspective. And now he has told us. First the high points: Pundit finds the Mission Generator is "quite fine, a truly useful mechanic" and he has high praise for the other Generators in the book, saying: "The whole section on generators is about 55 pages, and by all means the best 55 page block of both rule books. If this GM guide was just these pages, I'd probably be praising it to high heaven." The Generators are my favorite part too (there are 12 of them, encompassing 72 random tables). He does an excellent job of describing the structure and contents of the book. He seems particularly fond of the Downtime and Fiction Management sections (although he hates that I use the word "Fiction"). It's clear that he has read the books very closely, which I absolutely appreciate. Pundit provides us with a very detailed section-by-section overview, which should be very helpful to anyone who's considering playing or purchasing the game. But of course, the influence of narrative logic in DayTrippers is too much for the Pundit to stomach. The very concept of gaming as "Art-with-a-capital-A" is something he considers a sign that we have entered "Swine Country" (that's a Pundit colloqialism for storygames). Indeed, he feels that the entire game has been infected by "the brain-eater of storygaming", and he applies various colorful epithets to communicate his feelings on this issue. None of this should come as a big surprise if you're a regular reader of his. In summation, Pundit tells us: "I think the best I could say is this: if you peeled away about half of these books' total page count by removing all the superfluous Storygame stuff, you'd be left with a fine RPG." 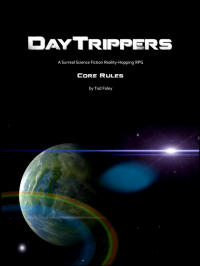 Which means of course, that if you like your games with a bit of that "Storygame stuff", DayTrippers is a fine RPG!